9.9% Below National Average (For Metro). Nearby access to state parks, beaches, mountains and our state capital. Atlantic Beach and Raleigh are just over an hour's drive. Ranked 4th safest City in North Carolina. 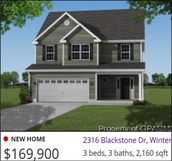 The Town of Winterville is a full service municipality located immediately south of Greenville in the central coastal plain region. The current population of 9,447 (2013 NC State Budget and Management estimate) is growing at a rate of approximately 1,000 new residents per year. In the heart of Eastern NC, Winterville combines a welcoming small town serenity with the conveniences of the adjacent City of Greenville. Winterville is located 85 miles south-east of Raleigh, less than 80 miles inland from the NC beaches and close to many other historic towns and cities in the state. Winterville is truly a great family town in which to live, play, visit, work and retire! You’ll feel at ease among friends and neighbors who cherish our small town “Slice of the Good Life!” while enjoying the advantages and amenities of a city. There’s year-round outdoor enjoyment in our Eastern NC fresh air and mild climate, a low cost of living and beautiful homes. Stay healthy and safe! Vident Medical Center is nationally ranked as one of the highest performing hospital for numerous specialties. Ranked 4th out of Safewise’s list of the 50 safest cities in NC, Winterville has become regionally known for safety and community unity. The Town of Winterville sponsors a variety of programs and activities which contribute to the relaxed, family-oriented lifestyle for which the community is becoming increasingly well known. For more information, visit Winterville's Chamber of Commerce website or the Pitt County Development Commission website. Winterville is fortunate to have some of the best public and private schools in the state located within Town. We are home to Pitt Community College, one of the largest community colleges in the state and minutes away from East Carolina University, the third largest university in the state. Outside of work, our residents stay busy! In Winterville, you’ll enjoy local festivals, endless restaurant choices, indoor entertainment, as well as local outdoor recreation and nearby access to state parks, mountains, beaches and our state capital. We have indoor theaters, recreational facilities and leagues, bowling alleys, NCAA Division I sports and an abundance of stores for shopping. Rivers, creeks and open lands, outdoor fun, music and movies in the park, as well as museums and much more make Winterville a delightful place to call home! Our neighbors at East Carolina University, with its schools of Art, Theatre, and Music, provide the cultural diversity of a major metropolitan area. Musical, theatre and dance groups offer more than 200 free shows annually. And if that’s not enough, Pitt Community College offers a variety of cultural events and classes to fill your nights and weekends. Winterville residents enjoy the small town feel with big city entertainment! Highest average temperature is in August at 79.8 degrees. The coldest average temperature is in January at 45.4 degrees. The average temperature of Winterville is 60.52°F, which is higher than the North Carolina average temperature of 58.70°F and higher than the national average temperature of 54.45°F.